We offer a comprehensive range of compressed air and gas filtration products for use in almost every industrial environment. Within our new Alpha Series range of threaded filters we offer 19 models with connections from ¼” to 3” and flow capacities up to 1500 SCFM (2550 Nm³/h). 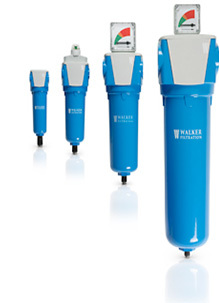 Manufactured in cast aluminum alloy with Walker E-coat™ protection, the optimized modular filter design ensures that high performance, ease of installation and multiple close coupling is continually achieved. Our Alpha Series range of threaded filters are independently tested and validated to ISO 12500 to give complete peace of mind.